Looking for inside information on living on one of the 16 fronds on Palm Jumeriah? Residents, past and present, are happy to share their villa experiences. Palm Jumeirah, a manmade structure, can be seen from space. At ground level this is a huge development by Nakheel accessed from Al Soufah Road by way of the ‘trunk’ which leads up to the fronds, passing the Shoreline Apartments on the way. At the end of the Shoreline Apartments the road curves to the left leading to the beginning of the fronds. The ‘fronds’ branching out from the ‘trunk’ are labelled in alphabetical order from A to P in an anticlockwise direction. The views vary from Burj Al Arab and Burj Khalifa in the distance to Jumeirah Beach Residence which looks amazing at night. There are 15 different designs – 10 for what are known as Signature Villas and 5 for Garden Homes. Each frond is approximately one mile long with nearly ……. villas on each. A few shops are close by (but you would need to drive or ask for a delivery – Milk & Honey for example is an upmarket grocery shop which will deliver to your Palm Jumeirah villa – Contact Number is +971 4 432 8686). Currently the nearest supermarket is in Mall of the Emirates (Carrefour) or at Ibn Battuta Mall (Geant). A few ‘express’ stores are nearer but their stock isn’t as great and they are slightly more expensive. The private beaches are private to all owners on that particular frond so there is no fully private beach front. The views can be amazing, the water great for canoeing, boating or swimming. No jet skis are allowed in these areas. Each villa has a swimming pool, the Garden Homes have ‘swimming’ pools but they are small and better described as dipping pools. Landscaping is the responsibility of the owner (who may pass this responsibility to the tenant) however there are rules and regulations including the percentage of the private gardens given up to lawns and plants, the type of trees to be planted etc. So quite restrictive in some ways. Planning is also pretty restrictive but it helps keep the fronds from being over-run by grandiose structures or creating a beach front obstacle. There are reasons for everything! The roads on the fronds have any number of speed bumps or ‘sleeping policemen’ which can be quite irritating but again these have a necessary function – keeping your speed down as this is a child friendly area and the size of the gardens onto the road is quite limited so the children may play on the street. Be careful. There are security staff at the beginning of each frond who ensure the security of the fronds. A security patrol boat inspects each frond every morning. Now, what we want is to hear from you. 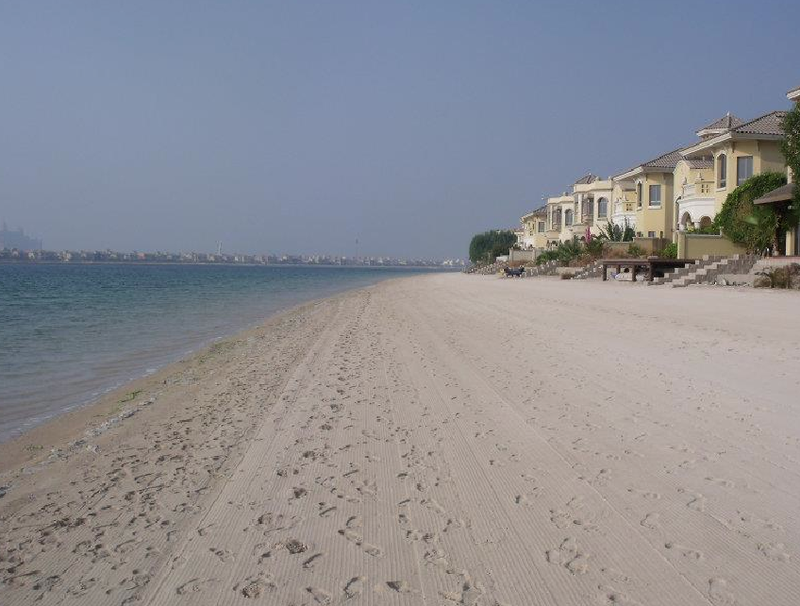 Are you an owner, tenant, agent in Palm Jumeirah villas. What’s your take on living there? How did you find the villa you currently occupy? Did you find any good Palm Jumeirah real estate brokers? Do you know of any good interactive maps for Palm Jumeirah? What about the journey to and from the Palm Jumeirah? Is it an easy drive? Is security ever an issue for you? Do you have your groceries delivered? Are your neighbours helpful/friendly/downright rude? Name your frond and tell us all. Names and personal details will remain confidential to the Editor at Dubai Survival Guide and will not be published or provided to any third party at any time. So write away to your heart’s content and bare all.